©1987-2018 F. Dörenberg, unless stated otherwise. All rights reserved worldwide. No part of this publication may be used without permission from the author. A Stollen is a bread made of a yeast dough that is sweet and (very) rich in butter, with raisins and/or currants, and candied orange and/or lemon peel in it. It is often covered with icing and/or powdered sugar and has a core of marzipan. 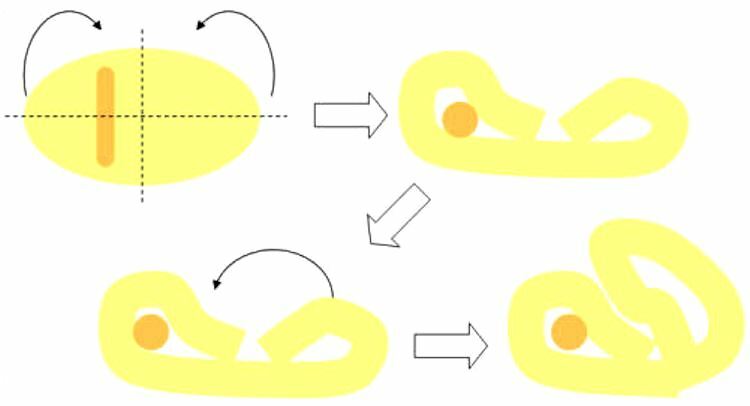 The typical shape is oblong and relatively flat. In Germany, this type of pastry bread is traditionally eaten around Christmas, hence "Weihnachtsstollen" or "Christstollen". The name "Stollen" probably dates back to the medieval German word "Stollo" for (support) post or log. Before the 1500s, Stollen actually did not contain butter, as this decadent indulgence was not allowed during the pre-Christmas "Advent" fasting period. Then a pope gave his permission, initially only for royal families, and (of course) only against a fee per loaf. Sugar, almonds, raisins and spices do not seem to appear in the recipes until the early 1700s. 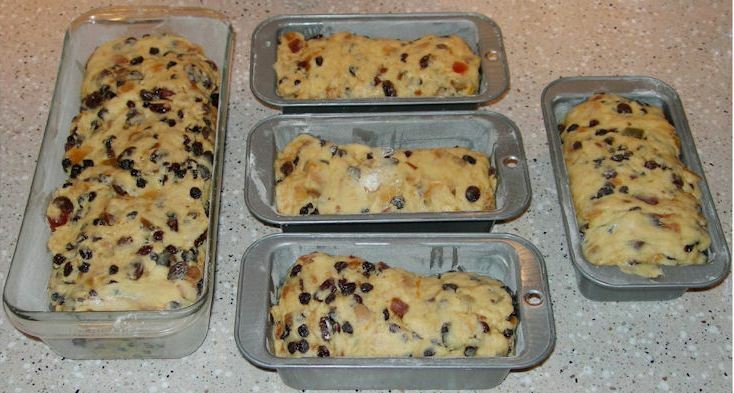 Stollen can be baked in a loaf pan ("Stollenbackform"). However, this is not allowed for "Dresdner" Stollen - they must be "free" baked on a baking sheet. Marzipan probably originated in Persia (present-day Iran) and came to Europe in the Middle Ages with the Arabs (notably in Spain) and the Turks. The name may have Persian or Arab roots, or be derived from the medieval Sicilian "marzapane". It found its way to northern Germany and the Baltic countries via the ports of the Hanseatic League. In Germany, a distinction is made between "Marzipan" and "Marzipanrohmasse". The latter is a marzipan almond paste that is made of 2/3 blanched and peeled almonds (of which no more than 12% bitter almonds) and 1/3 sugar. This is then heated to reduce the water content. Sometimes almond extract and/or rosewater is added to enhance the almond flavor. Such almond paste is what is typically used inside pastries. Regular marzipan has a (much) lower almond content and (much) more sugar. It is often colored with food dye and made into small shapes (fruits, animals, ...), or rolled into sheets to cover cakes. I adapted this recipe from a 2007 recipe prepared by Alfons Schuhbeck during a cooking show on German television. The fruit filling must be made 1 day before making the bread! Making clarified butter: 40 minutes. This can be done several days before making the bread! Must be made at least 7-10 days before serving! Must be kept at cool place. Makes 2 loaves of about 1.7 kg (3.7 lbs each), or several smaller loaves. 120 grams sliced almonds (D: gehobelte Mandeln, Mandelblättchen, F: amandes effillées), toasted. 250 grams currants (D: Korinthen, F: raisins de Corinthe, NL: krenten). 250 grams dark raisins. I prefer Thompson raisins. 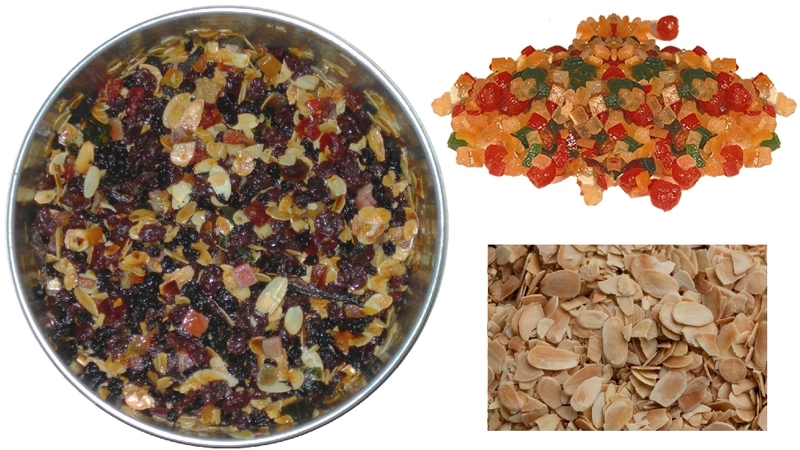 300 grams moist candied fruit mix, diced (D: 200 grams Orangeat + 100 grams Zitronat, F: macédoine de fruits confits). 1 tablespoon almond extract (not artificial flavoring! ; D: Bittermandelaroma; F: arôme d'amande amère). 120 ml (1/2 cup) dark rum. My all-time favorite dark rum for mixed drinks, cooking and deserts is Meyers's Original Dark Rum from Jamaica. Zest of 1 untreated orange. Zest of 1 untreated lemon. 100 grams fresh baker's yeast. This is sold in small blocks, in the bakery/pastry department of good supermarkets. It is kept in the refrigerator. My local supermarkets sell them in standard cubes of 25 or 40 grams. If you live in an area where this is not available, you can try and use packages of dry baker's yeast granules (I have never tried this, though). Dry yeast typically has 1/3 the weight of fresh yeast, so you would need about 33 grams. Standard envelopes are 8 grams (equivalent to 24 grams fresh yeast) - but: check the label! I always use orange blossom honey, as it is by far the tastiest. The flavor of honey from flowers such as lavender and acacia is much too strong! 520 grams cake/pastry flour (D: Type 405; F: type 45), divided into 200 grams and 350 grams. 300 grams all-purpose flour (D: Type 550; F: type 55; US: all-purpose / bread flour). 400 grams unsalted butter, at room temperature (take it out of the refrigerator about an hour before making the dough). 2 teaspoons of fine sea salt. 400 grams almond paste (D: Marzipanrohmasse) with at least 50% almond content. Do not use cheap, white or colored marzipan. It usually has potatoes and/or beans in it, and no more than 20-30% almonds. If the almond paste is approaching (or beyond) its expiration date ( = dry and dark), it may be dry and hard. Add 1 egg yolk and 1 tablespoon of heavy cream or whole milk; or 2-3 tablespoons of real rosewater; or: a combination of egg yolk, cream/milk, rosewater. Depending on where you live, you can also buy clarified butter: "Butterschmalz" in Germany (sometimes called "Bavarian olive oil"), and "ghee", if you have an Oriental supermarket with Indian products. But it is easy enough to make yourself. It also keeps well, and can be heated to higher temperatures than butter. Do not use artificially flavored sugar - it has no vanilla in it. In the USA, do not use the white fluffy stuff that is sold as vanilla powder. Powdered sugar (F: "sucre glace"). Large frying pan (for toasting the slivered almonds). Medium size bowl (for the fruit mix). Medium size bowl for the flour. Plastic kitchen film (cling wrap). Large bowl (for the dough). Wire whisk (for loosening up the flour). Measuring dry ingredients by volume is not a good idea, as the amount of ingredient then depends on how tightly you pack it. I use an inexpensive electronic kitchen scale. Kitchen machine with dough hook. Medium size sauce pan with heavy bottom, or pan with regular bottom plus a diffuser (to be placed between the pan and the stove burner). If baking "free-style" on a baking sheet: oven paper (parchment), enough to fold twice ( = 3 layers) and cover the entire baking sheet. 2 large cake/loaf pans of about 25x10x2½ cm (10x4x2¾ inch). This is about the maximum size you should make, to avoid breaking the loaves when manipulating them! 3 medium size loaf pans of about 24x9x6 cm (9½x3½x2½ inch; 1 liter / 1 quart). This works very well, and actually makes loaves that are easier to handle than larger loaves, or flatter Stollen that are baked without a pan. In this case, increase the amount of almond paste from 300 grams to 450 grams (1 lb). 1 medium size loaf pan of about about 24x9x6 cm (9½x3½x2½ inch), plus + 4 small "gift size" loaf pans of about 14x8x5 cm (5½x3x2 inch). See photo at the bottom of this page. An option in-between sheet-baking and pan-baking, is using a baking sheet and two fixed (or adjustable) baking frames that are rectangular or oblong (see photos below). Meat thermometer (for checking the core temperature of the loaf); I use an inexpensive electronic one. If you don't have one, use a metal skewer to check doneness of the baking. 2 wire racks (cake rack / cooling rack), large enough to hold a loaf. Brush (for basting the hot baked loaf with melted butter). Put all the fruit mix ingredients (including the scraped out bean) in medium size bowl, fold over several times to mix well and coat with rum. Cover the bowl with plastic kitchen foil. Let sit for 24 hours (or at least overnight) at room temperature. Stir every couple of hours. Make sure the milk is lukewarm/tepid and put into the bowl of your kitchen machine. This is easiest to do by putting the bowl on the kitchen scale and adding honey with a spoon until you have added 100 grams. If the honey is very thick (it should easily drip off the spoon), you can make it more fluid by briefly heating it up the honey jar (without the metal lid!!!) in the microwave oven - 10 sec max (!!). With your fingers, break up the blocks of yeast and add to the milk. Whisk to fully dissolve the honey and the yeast - make sure you get the yeast that sticks to the bottom of the bowl. In a medium size bowl, whisk the 200 grams of the 520 grams cake/pastry flour, to loosen it up and get rid of clumps, if any. Using a whisk is much quicker and easier (incl. cleaning) than using a flour sifter! Add the flour to the milk mix. With a large (wooden) spoon, mix until the mass is smooth - make sure to dissolve all the lumps! Lightly beat the the eggs and the egg yolks, and mix into the pre-dough. Dice 100 grams of the 400 grams of the butter into the pre-dough, about a tablespoon at a time. Put the rest of the flour (320 grams of the cake/pastry flour, and the 300 grams all-purpose flour) in a bowl and whisk. Add the flour mix to the pre-dough. Thoroughly knead with the dough hook (speed level 1 or 2 on a 5-speed scale, briefly speed up once in a while). Continue kneading, and bit by bit, add the rest of the butter. Continue kneading for 3-5 minutes, until the dough is completely soft and smooth. Briefly increase the speed (to level 3 or 4 on a 5-speed scale) and check if the dough forms into a ball that detaches from the bowl. If it does not, stop the machine, spread a tablespoon of flour over the dough, and check again. Repeat if necessary (but you should not need more than a couple of tablespoons of flour in total). Scrape the dough al the way down the inside of the bowl with a spatula, dust the dough with some flour, and cover the bowl with plastic kitchen foil. Let rise at room temperature for one hour, or until the dough has doubled in volume. Sprinkle the salt over the dough and briefly mix into the dough. Fold over the fruit mix one more time, remove the vanilla bean, and add the fruit mix to the dough. Briefly knead with the dough hook at low speed until the fruit mix is well incorporated. Note: the elastic dough is yummy all by itself! Crumble the almond paste into a bowl. If that doesn't help: add a beaten egg yolk and a tablespoon of heavy cream, and knead. Alternatively, use a 2-3 tablespoons of (real) rose water and knead; this also a standard way to enhance the almond flavor. Mix thoroughly and knead well (this takes some elbow grease and a strong fork). Shape the paste into a ball and cut in half, then dust with powdered sugar. On a flour-dusted counter, roll each half into a round bar of about 30 cm (12 inch) long (almost the length of the pan) and 3 cm (1½ inch) diameter. I pre-shape each bar, then wrap them in kitchen foil, and do the final shaping. Note: the purpose is to remove water and milk solids from the butter, and end up with only the tasty butter fat! This is done at low temperature, as the butter should not turn brown at all! Cut 350 grams of unsalted butter into pieces. Melt the butter at lowest heat in a heavy duty pan, while stirring occasionally. When all the butter is completely melted, slightly increase the heat. Small bubbles will begin to form and the water in the butter will begin to evaporate; white foam will float to the surface and white protein parts will form on the bottom of the pan. Keep at a slow rolling boil. When all the water is evaporated, the temperature of the butter will go up by itself! The white milk solids will slowly caramelize (only the milk solids, not the clear yellow butter fat!!!). When all the white flakes have disappeared (some white froth will remain on top) and have turned into brownish granules on the bottom, turn off the heat and let rest for a couple of minutes. Scoop off the white foam with a spoon. Carefully pour off the clarified butter, making sure to leave the brown granules in the pan! Can be kept in the refrigerator for several months (will be white and solid when cold). Making clarified butter - not difficult! Pre-heat the oven to 175 °C (350 °F) with circulation fan OFF. Roll out each half into an oval shape (or press by hand), about 1-1½ cm thick (½ inch), 35 cm wide, 45 cm long. Put the baking pans or the baking sheet with the loaves at about mid-height in the oven. Bake for 50-60 minutes - with the oven's circulation fan OFF. An inserted metal skewer must come out clean - be careful not to stick the skewer into the almond paste, as it will look like it is not done baking yet! If you insert a meat thermometer, it should read 96-98 °C (205-210 °F). Heat up the clarified butter until completely liquid. While the loaves are still hot/warm, generously brush them on all sides with the hot liquid clarified butter - careful: the loaves are quite fragile while hot, don't break them when rolling them over, lifting them, or putting them straigt up! Cover the loafs on all sides with the vanilla sugar. Generously cover the loaves on all sides with powdered sugar. Let the loaves cool completely. Wrap each loaf in aluminum kitchen foil, making sure to fold-over and crimp the seams (it needs to be airtight; e.g. in a gallon-size ziplock freezer bag, with the air sucked out). I sometimes make a loaf or two for Easter instead of Christmas.